Home > Preventative Maintenance > Does Dental Chewing Gum Work? We all want to have a beautiful smile along with healthy teeth, gums and a clean mouth. It seems as though there are lots of products claiming to help us in our quest but do they really make a difference? In the more recent years, dental chewing gum has come into the market and today, there are a variety of dental chewing gum brands that are meant to improve the hygiene and health of our mouths. It's important, however, to approach new products with caution and find out if they really do live up to their claims. But first, you need to understand what happens to your teeth after you consume a meal, particularly a sugary one. Whenever you consume a sugary meal or a sugary drink, your teeth are essentially 'under attack'. Sugars in foods and beverages react with the bacteria that are in plaque. This plaque sits on your teeth and the reaction between the bacteria and plaque leads to the production of acids. These acids are harmful to your teeth, so it is important to try to reduce their production and effects. Acids will erode tooth enamel and can trigger tooth decay and dental caries – also known as dental cavities. There is scientific evidence to show that chewing gum can help to prevent tooth decay because it increases the production of saliva, which has the effect of 'washing' the teeth after meals. It helps to reduce the impact of acids produced by bacteria and sugars on the teeth. So, the gum serves to act as a buffer of sorts. The specific artificial sweetener called xylitol is thought to have an added benefit. Some studies suggest is can directly impact the levels of bacteria in the mouth. 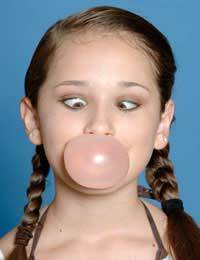 However, studies are still inconclusive on just how beneficial the sweetener is when used in chewing gum. In terms of dental chewing gum versus regular chewing gum, there is little difference to suggest the extra price of dental chewing gums is warranted. Some dental chewing gums claim to have granules that have a gentle buffering or brushing action on the teeth but there is little evidence to prove this has any benefit. For the added cost of these 'specialty' chewing gums, you could get some benefits from just chewing virtually any chewing gum, as they all increase the flow of saliva. Another thing to bear in mind is that these gums contain artificial sweeteners. With some of these sweeteners, excessive consumption can lead to laxative effects. For this reason, you would want to probably only use dental chewing gum occasionally rather than as a daily, regular practice after all of your meals. It's also believed that excessive chewing can lead to temporomandibular joint problems. If you chew gum often, you can suffer from muscle fatigue and pain around the jaw and face. Overall, if you have poor oral hygiene in terms of daily care, then dental chewing gum won't be a magic solution to protect your mouth and prevent you from having dental caries. But for those times when you do have a particularly sugary meal, dental chewing gum can help you to get your saliva flowing and help to keep sugars from bathing the teeth. If you can make the time as well, it's worth simply keeping a travel sized toothbrush and toothpaste on hand to do a quick clean after meals. It's cheaper and will do the trick to help you prevent tooth decay and maintain a clean and healthy mouth and gums.